Be sure to check out our NEWS page for new products! 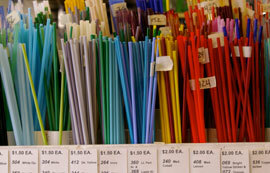 on glass or glass jewelry making your bound to be pleased with the selection you’ll find. We love to fuse at Weisser Glass, and when you see our selection, you’ll believe it! We have the Washington, DC area's largest selection of Bullseye glass products including sheet glass, frits, rods, confetti and stringers. 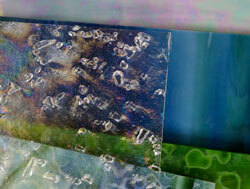 We stock a huge selection of dichroic glass and a large variety of slumping molds. We carry a variety of tools and products for painting, fusing and various kiln forming techniques. Stained Glass Weisser Glass Studio carries a complete line of tools and supplies for both copper foil and lead came techniques. We have an outstanding inventory of stained glass to choose from. 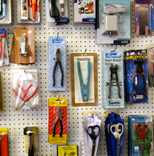 Click here for a list of tools, supplies and stained glass we carry. 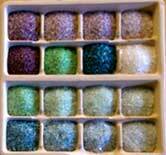 kits make it easy to get set up and started making glass beads. and glass jewelry making. We stock and/or can special order many more items than are listed here. 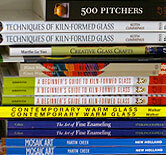 Weisser Glass Studio carries a variety of tools, books and supplies for making mosaics and mosaic stepping stones. We have an outstanding inventory of stained glass to choose from.We stock and/or can special order many more items than are listed here.